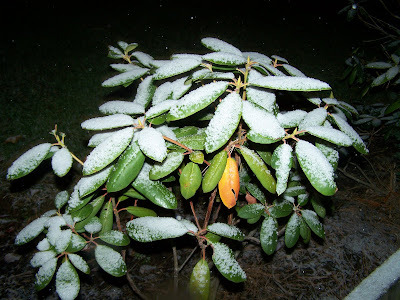 Tonight, our area got a light dusting of snow. It looks like someone up there was making shaved ice. 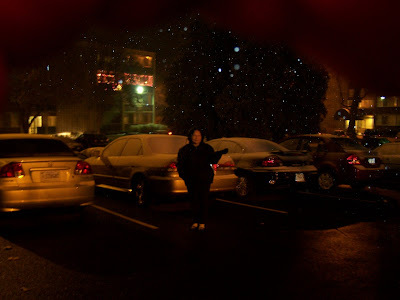 Here's Mom enjoying her first snow. Hopefully, there'll be more snow throughout the night. I've been meaning to post this photo I took on December 1st. I took several photos, but this one seems to be the most decent. This is supposedly the "rare conjunction of the Moon, Venus and Jupiter." Mom and I were in awe witnessing such a rare celestial treat. Have a happy Sunday Kayni & Mom :) ! Hmm..when can I have my first snow?! I didn't know about the moon, venus and jupiter thing. Sayang! Jeanny, The next conjunction will be in 2012, so be ready. Wits, I hope you had a fun weekend. Josiet, I hope you'll have your first snow soon. It can be fun. The snow on the leaves reminds me of the time Pinatubo erupted. Everything was covered with a thick layer of what looked like snow, which was actually ash and, sadly, hardened over time.